The Huawei Ascend G350 is a decent durable device with a strong feature list for a handset which will likely sport an affordable price tag. 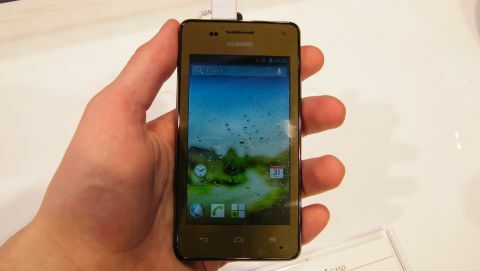 The Huawei Ascend G350 crept onto the scene at MWC 2013 with its big brother the Ascend P2 stealing all the limelight and getting its own press conference. Similar in many ways to the budget Ascend G330, the Ascend G350 sees the addition of a rugged chassis and IP68 dust- and waterproofing. Huawei is aiming the Ascend G350 at the affordable, mid to low-end of the market and expects the handset to arrive in stores in May/June. Although it's being billed as a rugged device the Huawei Ascend G350 doesn't look overly different to the rest of the smartphone world, a change from days gone by as tough phones looked to be pumped up on steroids. A metallic rim which runs around the edge of the front of the phone gives an air of premium quality when viewing from a distance, which is a pleasing aesthetical touch. It's a little on the chunky side, but that's probably due to the waterproofing which has been done to protect all the vitals, and at 125.2 x 65.2 x 11.98 mm it still sits well in the hand and the plastic case feels sturdy. We were assured by a Huawei representative that the Ascend G350 would withstand being dropped on the floor and hit hard on the desk, however they wouldn't let us test this claim at the show - boo! Around the perimeter of the Ascend G350 the plastic case is textured providing additional grip which means you can easily keep hold of it, even under water. It's easy to reach all the keys on the handset, with the power/lock button located on top and the volume rocker switch on the right both proving responsive. We weren't big fans of the bronze finish on the handset which we snapped, but the G350 also comes in black and while it may not be the most exciting of colours we prefer it in this case. The 4-inch WVGA display isn't going to blow you away and we found it was a little on the dark side even at full brightness, but we expect the Ascend G350 to be very keenly priced so this isn't a huge problem. There's a 1GHz dual-core processor under the hood which does a decent job of running Android 4.1.2 Jelly Bean, with no lag during our hands on time. It's certainly not as snappy as the more powerful handsets but you still get a decent Android experience and Huawei has only applied a light overlay meaning you still have access to all the core Jelly Bean features. Quick settings have been added to the notification panel giving you access to toggles for Wi-Fi, Bluetooth and GPS. Huawei has stuck with the stock Android keyboard on the Ascend G350 and thanks to the decently sized 4-inch display typing is pretty good on the responsive touchscreen, although we still prefer the SwiftKey alternative when writing lengthy emails. There's only 2GB of available storage inside the Huawei Ascend G350 so you'll need to be careful with the apps you download and content you transfer onto the handset, as that could fill up pretty quickly. A 1,730mAh battery is tasked with keeping you going all day, and due to the waterproof credentials of the Ascend G350 it's sealed into the handset to avoid water damage meaning you can't take it out and swap it. Round the back there's a 5MP camera minus a flash, but Hauwei has also included a 0.3MP front facing snapper as well which means video calls are an option on the Ascend G350. The camera app itself is pretty basic, but you do get a panorama mode and a handful of standard options such as brightness and white balance, all of which is easy to use. Shutter speed is a little of the slow side and image quality is acceptable, but not great with a lack of clarity and strong colour. The black version of the handset we mentioned earlier was chilling out in a bowl of water at the Huawei stand, and we were able to call the handset and witness it ring - proving its underwater abilities. Sadly though you cannot operate the Ascend G350 underwater, so if you're in the bath you'll need to keep it above the water line if you want to play Angry Birds. We may not agree with some of the colour options, but we look forward to getting the G350 in for review and putting it through its paces - we may even smash it against a desk to see if it can really withstand such a brutal attack.